It was noted that this IFLA section puts its presentations on the IFLA web site. You can go there for more information. The role of an academic library is to solve university-level problems. 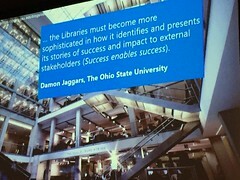 We are now increasingly thinking about d library in the life of the user. What does out constituency want to do? How can we help them do that? Collections -> network logic. Facilitate - acquired, collaborative, external. People -> partner and advocate. To be seen as an expert, your expertise has to be visible. Systems -> managing workflows and relations. CRM. digital scholarship, social. Place -> configured around user experience. This impacts our collections. Most library web sites are focused on discovery and a few services. Does the web site capture they value the library creates for its community? 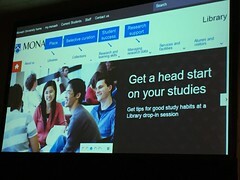 The Monash University library web site is organized around four sources of value. We need to begin our discussion of value about what our sources of value are. Yes, this plays into assessment. We need to understand the life of our users, so we can place the library in their context (Ethnography). Lessons and insights from the German project, a collaborative project. The projects is based on two convictions. There are preconditions for a new infrastructure. Working on an integrated authority file and placing missing data in records. Cloudbased systems evoke new problems in data privacy. Serious concerns: access from outside the European Area of a Justice. Technical support from outside the European Area of Justice should be possible. Need standardization of services in order to support a global partner model. Services need to be integrated. Ways out of cataloguing silos? Want to create a unified German data space. Tried to sync data across platforms, but it didn't work. Do not manage complexity, reduce it. 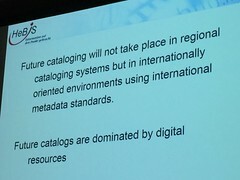 What about doing primary cataloging in WorldCat? This would reduce complexity. Needs enhancements in WorldCat. Not everyone sees this as a a plus. Need national data sovereignty in order to assure your ability to innovate. 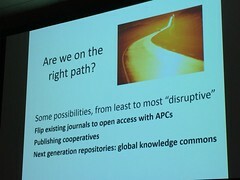 Martha Whitehead - Accessing information and disseminating research: are we on the right path? Retain our values: supporting local culture in a global knowledge commons. At each of our instructions? These are roles that are starting to play and which we will need to play into the future. The data she is showing is about science and scientists. Should we be part of the larger research enterprises? The questions posed to us can be divided into local and global. The change to focusing on a domain. The collaborative role of libraries in data management. What does collaboration mean? Some of these problems are not new. The question is who is in charge? Who will get us all on board? We do not want data to be placed behind pay walls. Can we have more white papers on how data is being managed? Metadata is a key area where librarians need to step up. Some researchers are turning to the library for help with their metadata. We need to have repositories data identified that will handle specific types of data. They then can create standards. Workflow is the new content. People will follow a convenient path. Elsevier, through acquisitions, is trying to create end to end work flow that people will use and depend on. 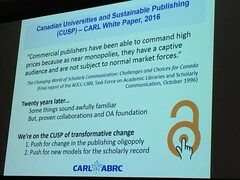 Springer/Nature is working to compete with Elsevier. Whoever is managing the workflow will get the content. 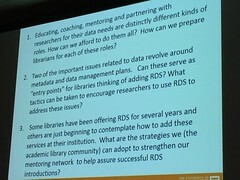 Can we work with agencies to get them to require funded research projects to work with the library on keeping data? Will agencies enforce the rules they have out into place? Who will researchers listen to for advice? 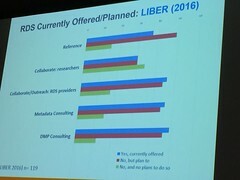 Could the listen to other researchers who have had a positive experience with Elsevier, for example? 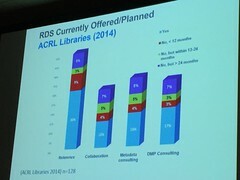 Is managing data the right thing for libraries to do? A proactive question. Teachers and policy makers want to have access to data. Is this something that every library needs to do? Perhaps a local library interfaces with the larger repository and assures compliance with/for local projects. Should all data be kept? What is our collection policy? Some data may be test data and could be discarded. It was noted that data may be reformatted when it enters a repository and placed in a standard format. It is then not the original data. It is not a backup of the original data. Provenance is very important. Should / could a standards organization get involved?